Bookmakers breathed a significant sigh of relief, after the heavily punted Charlie Moore-trained duo of Bazzat (6.15) and Penny Green (8.15) failed to figure in their respective returns to the racetrack. The non-existent County Donegal trainer had the betting industry on tender hooks, after revealing to the Racing Post and various media outlets that he stood to win "well over six figures" if his two horses came home in front. Moore's duo both returned to the track after hefty layoffs, and that certainly told as the anticipated coup somewhat flopped, when Bazzat faded tamely into seventh in the Class Six sunracing.co.uk Handicap, before Penny Green dwelt in the Wolverhampton finale - the Betway Handicap and never played a part in the nine furlong contest. Several bookmakers were running for the hills prior to the six race card, including Sky Bet - who had stopped taking doubles on the two horses before the first leg was run. Bazzat was initially priced at 50/1 by Paddy Power on Monday night but went off a tenth of the price, whilst Penny Green plummeted from as big as 100/1 to just 7/1 before the start of her race. (Credit: Racing Post) Speaking before the fixture, trainer Charlie Moore said: "The horses haven’t run for two years but they’re spot-on and we’re hoping big things can happen. "We haven't got a lot on the double to be honest, but if it comes off we’ll still have quite a lot to take back home, well over six figures. "Moore added: "Bazzat ran 19 times as a three-year-old and the owner has been very patient, keeping him for two years and resting him. "The mare, Penny Green, was just very weak and needed time, which is why she’s been off so long. "We've got them fit and ready and they're in very weak races – if they can't do anything here we don't know where we're going to go with them." 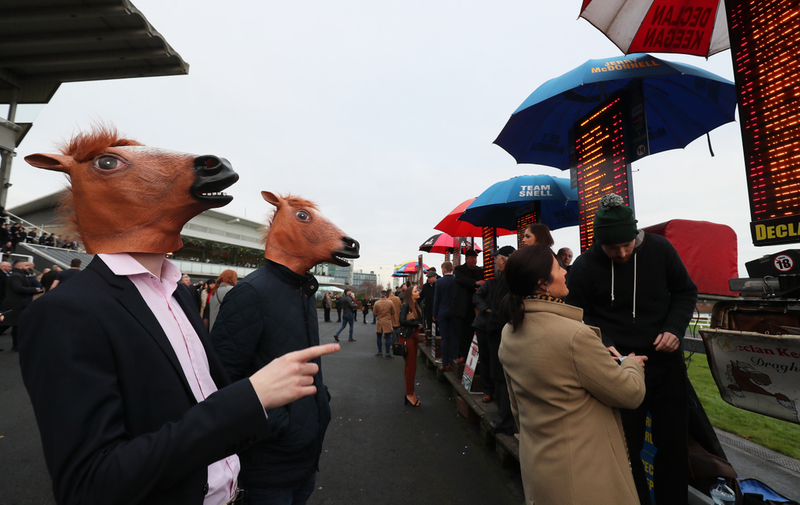 Incredibly, the series of events came exactly 365 days after another famous gamble at Tramore failed to come off, when bookies again avoided six-figure payouts. Victory for Tornado Watch, owned and trained by Emmet Mullins, lifted hopes of a batch of big-priced doubles being landed, until the defeat of Sunday At Augusta in the final bumper meant bookies avoided a high-profile bashing. Tornado Watch was a best priced 16/1 earlier in the day and returned the 11/4 second favourite, whilst the Stephen Murphy-owned Sunday At Augusta started the day as big as 50/1, before being sent off a 5/2 shot. The now six-year-old ran bravely in defeat, but could never get on terms with the Gigginstown-owned Cuneo, eventually coming home a good second - but agonisingly for punters. Paddy Power were among the firms that would have been absolutely destroyed by the gamble, offering the double at odds of 532/1 earlier in the day.